"A lake is defined as a reasonably permanent body of water substantially at rest in a depression in the surface of the earth, if both the depression and the body of water are of natural origin or part of a watercourse." Thus did professor Getches serve up his version of a legal definition of a lake. "Fresh-water lakes and ponds are bodies of standing waters distinguishable from rivers chiefly by the fact that they have no current. Frequently, also, they are inaccessible from the sea or from a distance without trespassing upon private lands. The fact that there is a current from a higher to a lower level does not make that a river which would otherwise be a lake, nor does a lake lose its distinctive character because there is a current in it for a certain distance tending towards a river which forms its outlet. On the other hand, the fact that a river broadens into a pond-like sheet with a current does not deprive it of its character as a river. Where it is admitted or not denied that the water is not a lake or a pond, the material difference between which is in size, the only criterion by which to determine whether it is a river, is the existence of a current, and this question cannot be answered by ascertaining what appellations have been given to it." "(T)he distinction between a stream and a pond or lake is that, in the latter case, the water is, in its natural state, substantially at rest." "The term lake ... comprehends a reasonably permanent body of water substantially at rest in a depression in the surface of the earth, and also the depression, both depression and body of water being of natural origin or a part of a watercourse. "A distinction is sometimes made between lakes and ponds. The term lake connoting a large body of water and the term pond connoting a small body of water ordinarily containing considerable aquatic growth. But since this distinction is based mainly on the size of the body of water, it is not essential for legal purposes, and the term lake as here defined includes both large and small bodies of water. "(A) lake is distinguished from a stream by the fact that in the former the body of water is substantially at rest while in the latter it has a perceptible flow. "To constitute a lake, a body of water must have a reasonably permanent existence. Many lakes have a permanent body of water. But the body of water need not be permanent in order to constitute a lake. Thus, a body of water which occasionally dries up in periods of drought is still a lake. On the other hand bodies of water, even though of considerable size, which collect only in times of heavy rain, flood or melting snow, and which soon dry up, are not lakes within the meaning of that term as here defined." "A lake, to that person, is a body of water of considerable depth surrounded by a well-defined beach or bank and with a reasonably permanent nature where one can swim if the water is not too cold." But even in Canada, where a river widens considerably slowing the flow of water, that section is often called a lake. For example, between Quebec City and Montreal, the Saint Lawrence River widens considerably, forming a bloated expanse known to residents and mapmakers alike as as Lac St. Pierre. 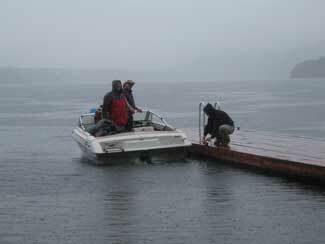 Image is Sproat Lake near Port Alberni, BC in 2006.